We begin our morning today in Cierva Cove, directly south from yesterday’s landing at Bailey Head on Deception Island. Cierva Cove is said to be a good location to see marine mammals. However, this morning the skies are dark and the air is cold. Cierva Cove is choked with brash ice, and light rain has been falling on and off all morning. Some choose to remain aboard the Polar Star as it is anchored just offshore of the cove, enjoying coffee in the warm lounge on the top deck and watching the morning pass through the large windows. Not to be put off by a little weather, most of the folks on board hop in zodiacs and set off for some cruising and sightseeing amid the ice in Cierva Cove. Brash ice and pack ice in Antarctica. Brash ices fills the ocean waters of Cierva Cove on the Antarctic Peninsula. The ice is a mix of sea ice that has floated near shore on the tide and chunks of ice that have fallen into the water from nearby land-bound glaciers. 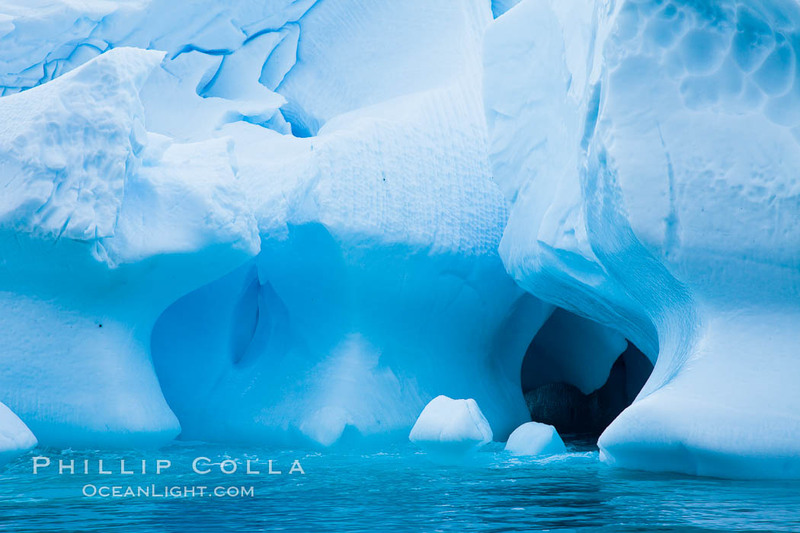 Antarctic icebergs, sculpted by ocean tides into fantastic shapes. Moving about through the ice maze proves to be a bit difficult in the zodiacs and we take it slow, choosing our route carefully. Currents stir the waters in the cove, and the ice is constantly moving albeit slowly. At times, the narrow channels we use close soon after we pass through so that we cannot return the way we came, so we just proceed onward. It is fun going. 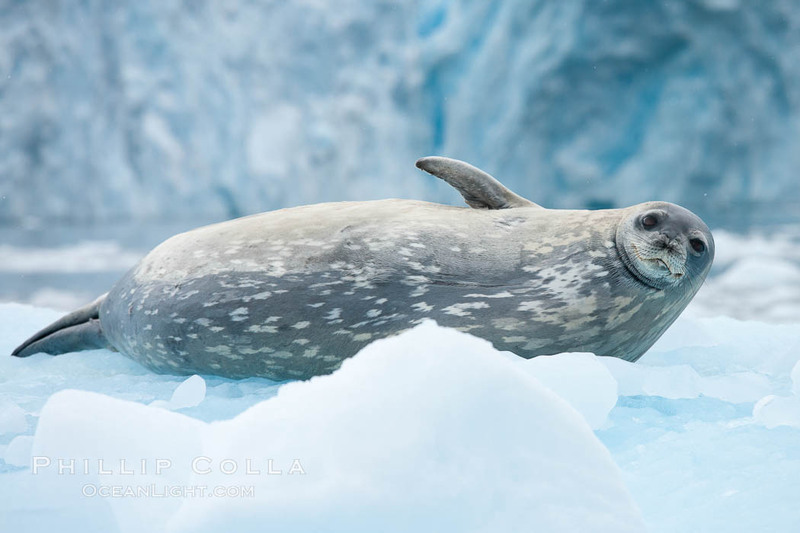 There are three species of pinniped to be seen in Cierva Cove: leopard seal (Hydrurga leptonyx), Weddell seal (Leptonychotes Weddellii) and Crabeater seal (Lobodon carcinophagus), and soon we have seen them all. Of the three, the Weddell seals are my favorite, exhibiting beautiful spotted coats more attractive than any other seal species I have seen. It is difficult to keep the cameras dry as rain continues to fall, so I am glad I have weather covers for my gear. 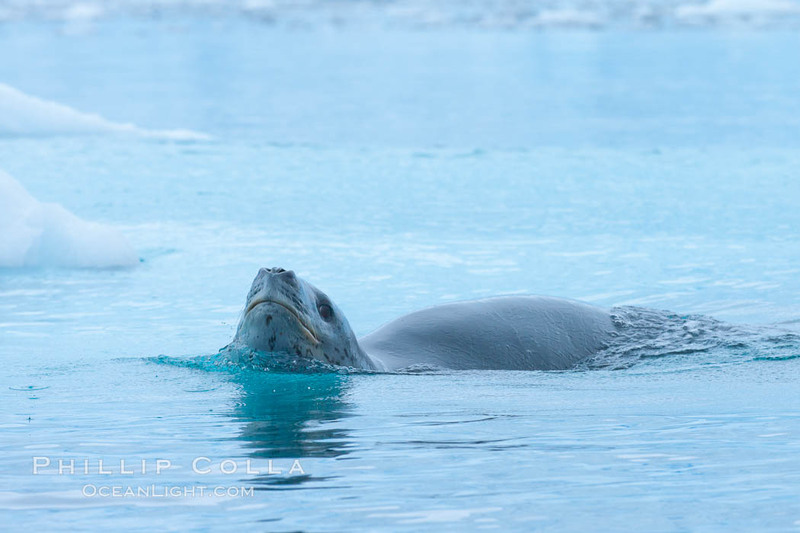 A leopard seal in Antarctica. The leopard seal is a large predatory seal, up to 1300 lb and 11 ft in length, feeding on krill, squid, fish, various penguin species and other seabirds and occasionally, other pinnipeds. 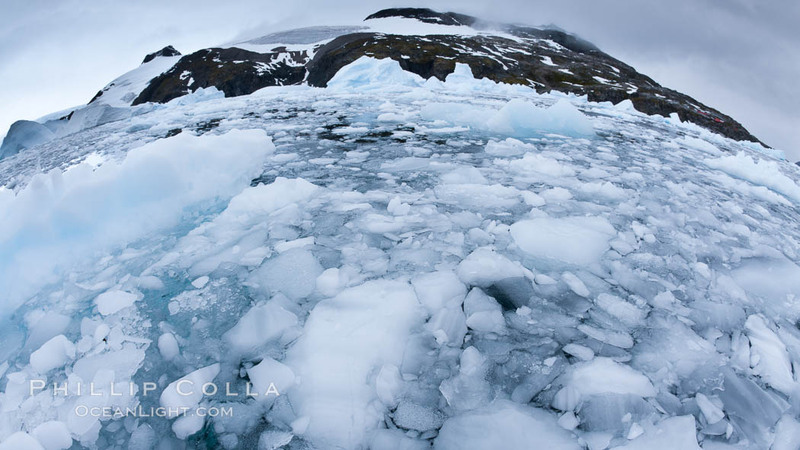 Three glaciers flow into Cierva Cove, plowing down from the inland slopes above us with towering walls of ice leading the way. These glaciers shed enormous blocks of blue ice, frozen floating progeny that will soon drift away from the cove and disperse into the ocean. Occasionally we see ice break from the face of the glacier and fall, calving with loud cracking sounds that echo around the cove. When the blocks plunge into the water they create long rolling swells that generate low rumbling sounds as the bergs around us bump together. 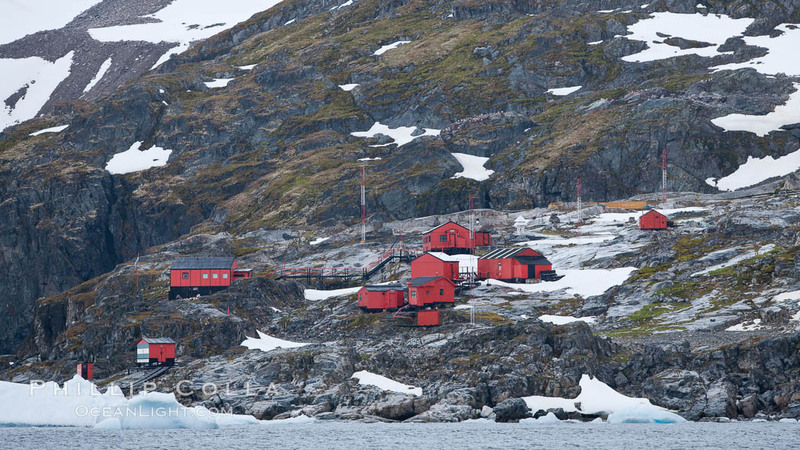 Argentina’s Primavera Research Station is located on an exposed rocky peninsula nearby, a group of small red buildings and several radio antennae. Given the weather we have today, the station looks like a very cold workplace indeed. Primavera Base, (Argentina) on the slopes above Cierva Cove, Antarctica. Zodiac cruising in Antarctica. 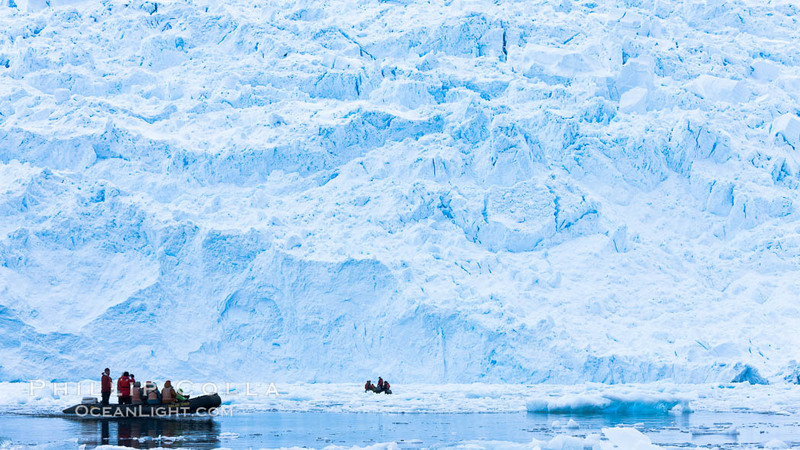 Tourists enjoy the pack ice and towering glaciers of Cierva Cove on the Antarctic Peninsula. Eventually we leave the thick brash ice and motor about in the open water a mile or so offshore, in hopes of seeing a whale. Indeed, we soon come across a few minke whales, fast and sleek. They seem inquisitive and swim near our zodiac a few times, then disappear with nary a clue as to where they have gone. Other zodiacs see minkes throughout the morning. Soon a small group of humpback whales are spotted. Doug Cheeseman, who is driving our zodiac this morning, has had years of experience boating near whales and does a great job of predicting where the humpbacks will surface. For 30 minutes or so the whales simply surface and sink back under. Eventually, however, they begin raising their flukes as they dive, providing the photographers on our inflatable with great ops. 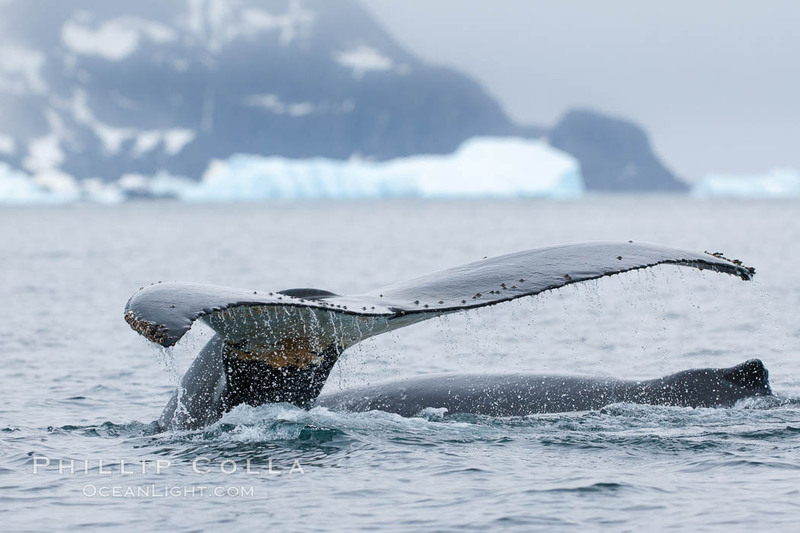 After watching the whales for a long time, everyone on the zodiac is eventually chilled to the core and we head back to the M/V Polar Star to warm up and move to the afternoon’s landing at Cuverville Island. This morning offered our best views of marine mammals on the trip so far. Southern humpback whale in Antarctica, lifting its fluke (tail) before diving in Cierva Cove, Antarctica.